Tandoori masala is a mixture of spices for flavouring foods cooked in a tandoor or clay oven, often used in traditional north Indian and Afghani cooking. Déli Spices Tandoori Masala adds delicious flavour and aroma to various Indian and International non vegetarian Tandoori dishes. Sanjeev Kapoor's - "Tandoori Masala"
We present Blended Spices with lovely aroma and flavors such as Tandoori Masala. We are offering a qualitative range of Tandoori Masala to our clients that are widely used in the tandoor items like chicken and mutton. These are perfectly blended to give it a distinct flavor and coloring properties. We offer a qualitative range of Tandoori Masala to our clients that are widely used in the tandoor items like chicken, mutton, , etc. These are perfectly blended to give it a distinct flavor and coloring properties. Well known spice in the Southern India, it has become an integral part of the kitchens in the hotels and restaurants. 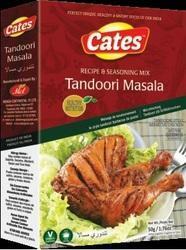 We are engaged in providing a high range of Tandoori Chicken Masala to our clients. 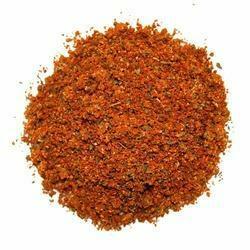 These Masalas are used in making special kind of tandoori known as Tandoori Chicken. These products help in making these foods delicious and tasty. These Masalas have no added colors and are purely hygienic in nature. We are presenting an excellent quality assortment of Milan Tandoori Chicken.